Ja, ‘Ginger’ in het Japans! Goed, dit is dus een -je raadt het al- Ginger rokje, in een stof die ik tijdens onze supertoffe vakantie naar Japan kocht. 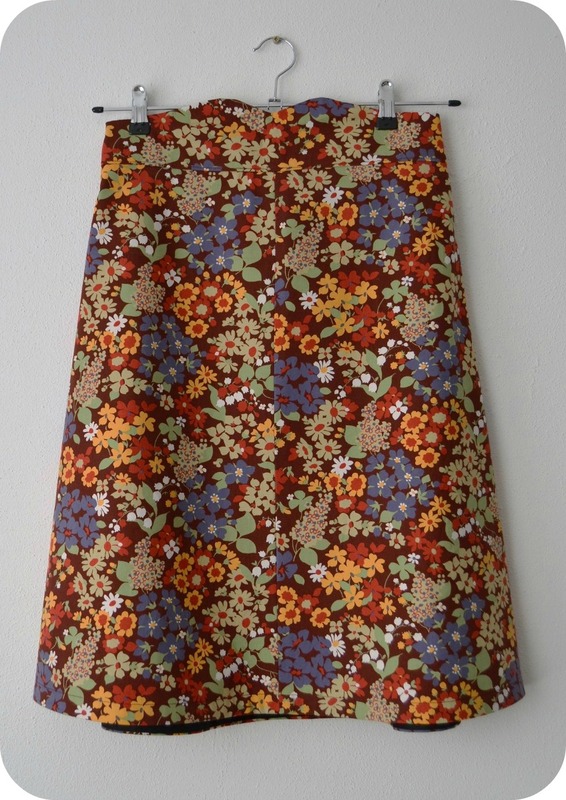 Right, so this is a -you’ve probably guessed by now- Ginger skirt, made out of fabric that I bought while on holiday in Japan. Het fijne aan dit patroon is dat er geen figuurnaden in zitten. Dat scheelt tijd 🙂 die tijd heb ik alsnog genomen om dit rokje netjes af te werken met een biaisbandje om het beleg van de tailleband en aan de zoom. The nice thing about this pattern is that there are no darts in it. It saves time 🙂 I did invest that time in finishing this skirt neatly though, with some biastape on the waistband facing and the hem. Wat ik me wel afvraag bij Colette patronen is waarom het achterpand van de rokken soms langer en niet recht is bij de zoom. Dat is bij deze Ginger het geval, en bij de Macaron en de Peony. Maar bij de Ceylon weer niet. Het heeft vast iets te maken met ruimte voor het achterwerk maar het stort me ook een beetje. 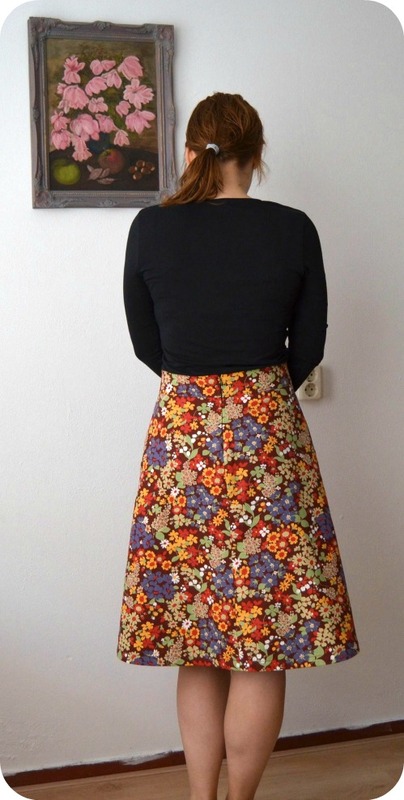 What I wonder, when it comes to Colette skirt patterns, is why the back part of the skirt is longer and not straight at the hem. It is that way on the ginger skirt, the Macaron and Peony dresses, but not at the Ceylon dress. It probably has to do with room for one’s backside, but it does bother me a little. I like that skirt a lot!! 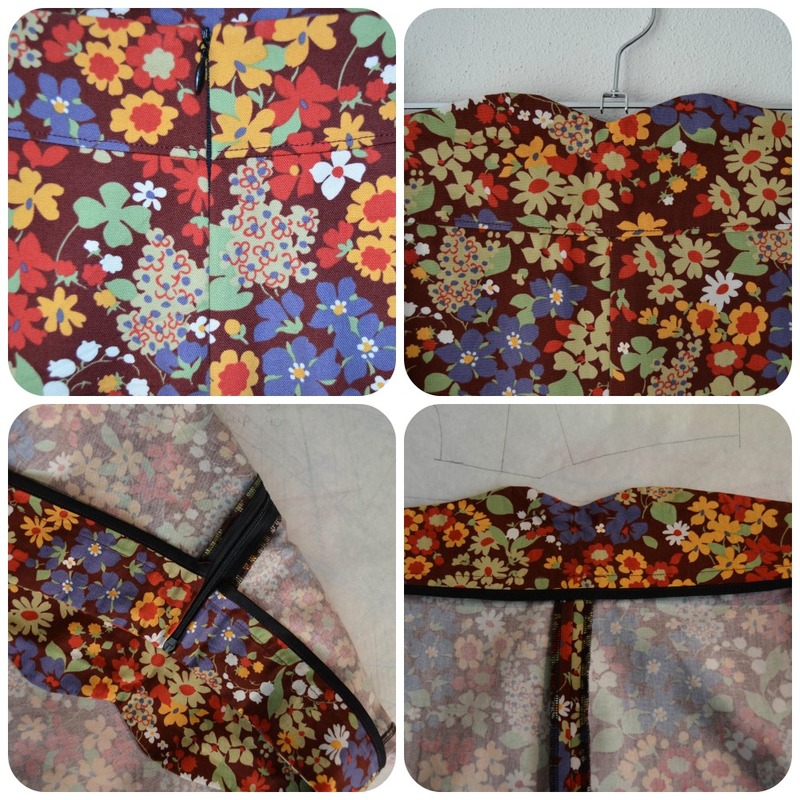 The waistband and the nice a-line cut…And the fabric is awesome! De bril en rok staan je beide superleuk! Goed kado zo’n camera! Ik fotografeerde vorige week met een point&shoot (ipv Canon Rebel) en dan merk je pas weer wat voor’n goede camera (en must) zo’n DSLR is! Thanks Nienke. Ja wat een verschil zeg. In alles gewoon. Echt heel fijn! Ik vind het ook geen ramp hoor, vind het zelf ook wel leuk staan 🙂 en hopelijk scheelt het hoofdpijn! In het café kom ik niet meer zo vaak dus daar kan ik mee leven geloof ik. De camera ben ik super content mee, dat ding kan bijna meer dan ik zelf. Nu nog even flink op ontdekkingstocht door alle functies en mogelijkheden! The glassess are great! You look fantastic in this new skirt! Thanks! Best wishes for you too, gelukkig nieuwjaar! Mooie rok! De bril staat je goed. Handig zo’n afstandsbediening voor je camera. Happy birthday!!!! Hope you have a great time next week. The skirt looks really cute! Gefeliciteerd! You look really cute with those glasses! Great skirt! Perfect skirt and cool glasses. The idea of becoming older and older seems to be interesting and becomes better if I see you on this sharp pictures. Hi Maria, thank you! I quite like getting older, I’m becoming more balanced and not so hard on myself anymore and I find that refreshing! wow, you look gorgeous in your glasses!! And the skirt looks positively perfect–very neat finishing. I use the d5100 too–enjoy! En ik vind je bril superleuk staan! Fijne verjaardag!!!! What a cracking start to the year! It’s the perfect combination of pattern and fabric and I LOVE it!! Thanks Jenny! I bought the fabric in the Tomato store, in Nippori. Were you there too when you were in Japan? It was the first fabric store we visited and I was so overwhelmed (still a bit jetlagged). Tomato was closed for New Year when I was there but guess what? I’m going back again in April for a friend’s wedding. I only have 2 days in Tokyo (hopefully enough time to get to some fabric stores) & the rest of the time in Kyoto, so there wil be plenty of time to visit Nomura Tailor, YAY!! Oh I’m so jealous!!! We are planning our next holiday and Japan is a serious option again hehe. Mooie stof!! En een heel leuk model. Mijn complimenten! Gorgeous skirt. Fabulous choice of fabric and the shape is just perfect! I didn’t change the hem curve, you can probably leave it as it is and it will hang straight because it accomodates your behind. You can always even it out before hemming if it doesn’t hang right. Good luck!